100 YEARS OF FILIPINO IMMIGRATION TO THE U.S.
Our approach to immigration is simple, yet powerful: We help our clients find the shortest legal path to a visa, green card or citizenship through foresight and careful preparation. We believe that your fees should pay for peace of mind and results; not for the filling of forms. We focus on saving you time and expense, by getting you on the right track, the first time. Through foresight and careful preparation, we help you avoid the cost of immigration stumbling blocks like appeals, motions to re-open, request for evidence (RFE), Notice to of Intention to Deny (NOID), deportation and more. People make mistakes—knowingly or unknowingly. They bury or forget their mistakes for decades. Mistakes or wrong-doing lead to visa or green card denials, and to arrest and deportation . We help our clients overcome those mistakes. Through waivers, we show our clients' compelling stories of merit, their special factors (mitigating and extenuating circumstances), and reform; We demonstrate the hardships suffered by our clients' qualifying U.S. citizen (USC) or legal permanent resident (LPR) relatives. We represent International Clients based in Washington DC, in 50 states and globally. ( Read more “ Local Lives, Global ties: Immigration Stories How We Got Here,” the immigration speech of our Firm’s founder, at the Smithsonian 2010 Folklife Festival, Washington, DC). 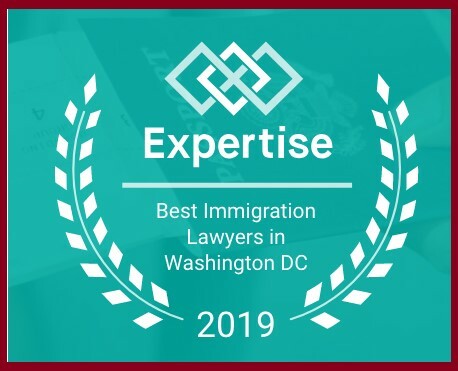 We are a Washington DC Immigration law firm, providing first class legal services for over 15 years in the heart of Washington, DC We are a walk from the U.S. Passport Office, the World Bank and Metro Stations/public transportation (www.wmata.com). FAMILY-BASED PETITIONS-- We help U.S. citizens (USC) or legal permanent residents (LPR) and their foreign born relatives -- reunite in the U.S.
EMPLOYMENT-BASED PETITIONS-- We help eligible U.S. employers and foreign born employees, advance businesses in the U.S., through employment-based petitions (professional, skilled and unskilled; temporary and permanent workers). SELF-PETITIONS--We champion our clients’ citizenship applications, special immigrant, humanitarian cases and national interest waivers for extraordinary/exceptional ability aliens. We take the unbeaten path, within legal and ethical bounds. Our founder’s first case in 1995 -- a labor certification application for a household cook -- broke ground. It was reported by an authority on labor certification applications. (Read More Recipe Yields One Perfect Cook BALCA Case Summaries 12/97 (http://search.aila.org/searchresults.aspx). “ Regarding the case for a Household Cook which I published at my BALCA Summaries……you overcame the burden of proof and established a bona fide job opportunity with extensive, persuasive, and probative documentation”. (Read More REVIEW by Joel Stewart ,editor of The Perm Book on labor certifications, lawyer at Fowler, White Boggs, PA; General Counsel, Brazilian Embassy, Florida). “I would like to express my gratitude for the invaluable counsel you gave me regarding my family's attempt to bring a relative to the United States from Bosnia. As a journalist who has covered the incredibly complex and often arcane world of immigration law... I was so impressed with the breadth of your knowledge and experience. Your ability to strategize and approach a case from a variety of directions is equally impressive. Clearly, you are extremely skilled in your field and a top-notch professional (Lisa Hoffman, Washington DC) Read more client testimonials and success stories. We keep our standards of excellence in representing clients by supporting the immigrant and legal community through continuing legal education, pro bono and other community outreach. (READ MORE CASE SUMMARIES AND ARTICLES http://search.aila.org/searchresults.aspx) . Our goal is to help transform simple or complex cases into success stories (Read More about Our Approach and Read More. Our Client testimonials). We represent both simple and complex immigration and citizenship cases; we help clients with local lives and global ties. (Read more our Smithsonian 2010 Folklife Festival speech, “ Local Lives, Global Ties; Immigration Stories: How We Got Here” www.folklife.si.edu). Our experience includes unique Washington DC Immigration cases, ranging from Visitors B visas to I-360 special immigrant cases for World Bank retirees and their household employees, fiancée visas/ green cards for military families. We have carved an expertise with clients from the Philippines, one of the four largest immigrant groups cited in the Visa Bulletin (www.travel.state.gov). We helped a Filipino with a relative petition, overcoming her 40 years of unlawful presence, and remain in the U.S. with her U.S. citizen family, despite multiple complexities. Our clients are international and their cases are varied; an example is the German exceptional ability alien, who we helped win a green card by proving that he transferred green roof technology to the U.S., thus serving U.S. national interest..Another is Ghanian J-1 exchange visa scholar, who we helped with a green card by obtaining a waiver of his home residence requirement under INA Section 212(e), 20 years from his entry. (Read More our Profile). © Copyright 2019 Riedmiller Law. All rights reserved. 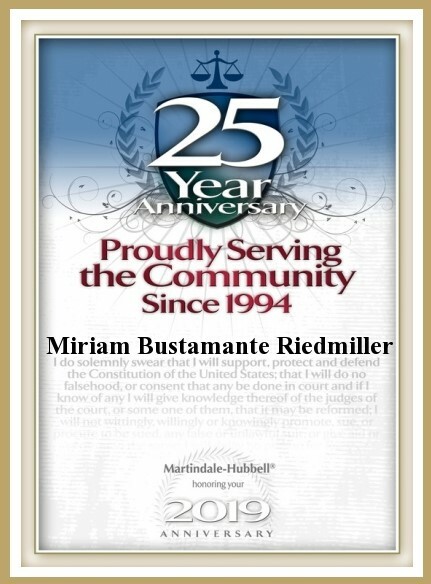 All information provided is provided for information purposes only and does not constitute a legal contract between Riedmiller Law and any person or entity unless otherwise specified. Information is subject to change without prior notice. Although every reasonable effort is made to present current and accurate information, Riedmiller Law makes no guarantees of any kind.